In firefox and chrome, there is support for SSL connection to the proxy. This feature permits to encrypt all trafics between the client and the proxy server. http://wiki.squid-cache.org/Features/HTTPS describe with more details the whole concept. This configuration is not available through normal parameter, it has to be activated using a .pac file. 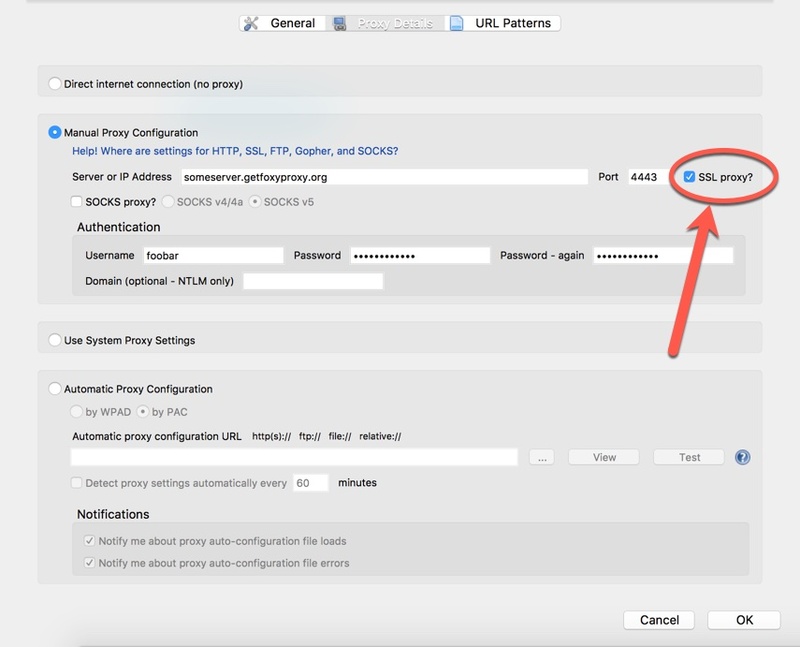 If the getproxyforurl returns a string in the form "HTTPS myproxy:8080" then the communication between browser and squid server will use an https connection. It has been successfully implemented and tested on mozilla firefox and google chrome browser on linux, mac and windows platforms. This feature is especially useful when one does not want to expose services to the internet but still want some chosen person to be able to use the service through an authenticated proxy server. By looking at the source of foxyproxy, the pac response is parsed but there is no support for HTTPS response. Support for this feature should be quite simple. Thanks, we are aware of the missing feature. We will add it shortly. I did some research on this. There is no support for this in the Firefox GUI yet. In the FoxyProxy extension, click the "..." and select the file you just created. That's it. The end of https://bugzilla.mozilla.org/show_bug.cgi?id=378637 explains how to do this with Firefox natively. please let me know if this works for you! It seems to work ok on foxyproxy_chrome. By looking at the code, it seems foxyproxy_firefox tries to parse the output of the pac file and forget the "HTTPS" case. Maybe there are other places to correct. Thank you. One of us will fix it. Note the quotation marks. Can you please try again in FoxyProxy for Firefox? I did correct the string at the first try. Problem is stil present with your new pac file. Yes, you were right that we need some code changes in the way FoxyProxy parses the PAC file. We will fix it. This is now supported natively by the FoxyProxy for Firefox addon. Version 4.6.1 for FoxyProxy Standard and 3.6.1 for FoxyProxy Basic. Just check the "SSL proxy?" checkbox on the Proxy Details tab. Make sure you change the port. We use port 4443 for this but your proxy servers may use something else.